Found 817 blog entries tagged as "10304". Monday, February 4th, 2013 at 3:48pm. 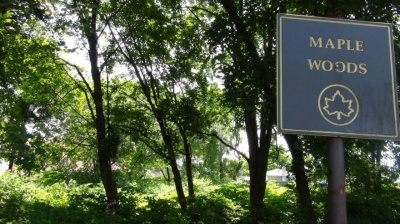 On the North Shore of Staten Island, you can find Maple Woods. This is a woodland park that is in a community sometimes referred to as Park Hill. Maple Woods is bound by Richmond Road and is between the streets of Steuben Street, Rhine Avenue, and Pierce Street. Monday, February 4th, 2013 at 9:13am. On Staten Island's North Shore, you can find the neighborhood of Park Hill. This neighborhood is close to the eastern shore, right above the Staten Island Expressway. 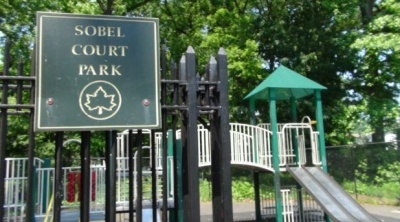 Within the neighborhood are a few parks-one of which is Sobel Court Park. Before this neighborhood was known as Park Hill, it was called Fox Hills after Lewis Henry Meyer's estate. Lewis H. Meyer was one of the founders of the Staten Island Savings Bank and was their President for ten years. When he bought his property on Staten Island, he built a nice estate that he named Fox Hill Manor, after his love of fox hunting. Monday, January 7th, 2013 at 4:01pm. In 1931, a school was constructed in the neighborhood of Grasmere at the corner of Targee Street and Naples Street. 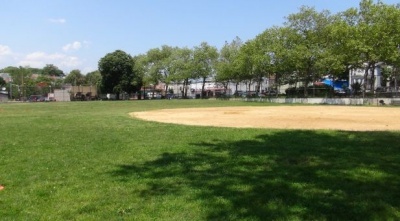 In 1953 and 1955, the City of New York acquired two plots of land to the east of the school, with Stanwich Street being their eastern boundary. Since the school first opened, these two parcels of land had been used as a play area for local residents, who named it as Concord Playground. 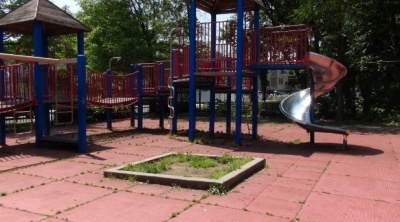 Once the two parcels were acquired by the city, a playground was constructed. It opened in 1965 under the jurisdiction of both the New York City Board of Education and the New York City Department of Parks and Recreation. At the time of its opening, it became known as P.S. 48 Playground, for the adjacent school. Friday, January 4th, 2013 at 9:15am. In 1895, a school building was erected in the neighborhood of Stapleton at the corner of Broad Street and what is now Wright Street. This school, Public School 14, was later moved to 100 Tompkins Avenue-not too far from the original site. Shortly after the school was moved, in 1947, the City of New York decided that they wanted to create a playground for Public School 14. By 1951, P.S. 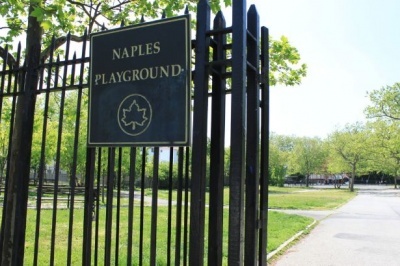 14 Playground opened under the jurisdiction of the New York City Department of Parks and Recreation and the New York City Board of Education. Friday, December 28th, 2012 at 12:16pm. On 8/24/2004, a one-family home in the neighborhood of Todt Hill, Staten Island, 10304, was publicly recorded as sold for $1,460,000. This home is at 76 Romer Road, which is located on block 870 and lot 111. It was built in 1960, on 33906 square feet of land and has a living space of 5530 square feet.